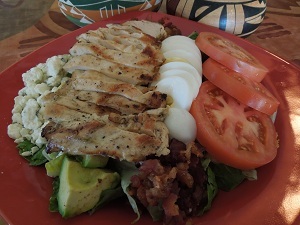 Sam’s Asada marinated grilled Chicken Breast served on a bed of crisp Romaine lettuce with diced Avocado, sliced Tomato, crispy Bacon, crumbled Bleu Cheese and sliced Egg. Accompanied by your choice of dressing. Mixed Salad Greens, shredded Carrots, sliced Cucumbers ‘n Tomatoes, Roasted Red Peppers and Red Onions. Your choice of Dressing. For “Garlic lovers”. 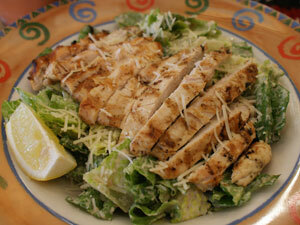 Made with fresh Romaine, Sam’s own creamy Caesar Dressing and toasted Croutons. Fresh Romaine leaves tossed with Sam’s creamy Garlic Caesar Dressing, then topped with grilled marinated sliced Chicken Breast and toasted Croutons. A fried Tortilla Bowl brimming with Salad Greens, seasoned Ground Beef, Refried Beans, Jack ‘n Cheddar cheeses, Guacamole, Sour Cream, Tomatoes, Cherry Peppers and Red Onion… Topped with Sam’s fresh homemade Salsa. Freshly grilled marinated sliced Chicken Breast served over Salad Greens with Pico de Gallo, Monterey Jack ‘n Cheddar cheeses, Guacamole, Tomatoes and Sour Cream. Warm Flour Tortillas served on the side. A 10 oz. “flame grilled & sliced” Bistro-style Shoulder Tenderloin Steak that’s been marinated in our Southwestern Chile seasonings and served over our “garlicky” Caesar Salad with crunchy Crouton; grilled to order and served with Flour tortillas.